Back to school is fast approaching. I was so excited when Crayola sent me a box of supplies to review. I included some of the ones they sent me and added some of my personal favorites. 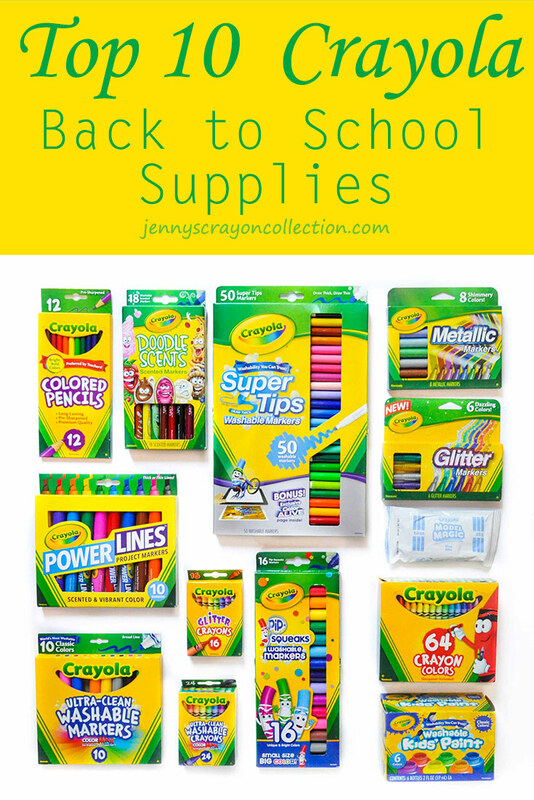 Here is my list of my top ten Crayola back to school items to help you navigate the Crayola aisle at the store. There is an added bonus of the number one teacher item from Crayola. I was surprised to see what it was. My background is a preschool teacher and a mother of two little ones, a girl age five and son age three. I received one or more of the products or services in this post below for free, most of which I already owned a copy of. Crayola sent me a box of school supplies to review. I have included some of them in the review and some of them are my own personal favorites. I am providing my honest review of the items. 1. Model Magic Crayola did not send me this one to review in the box, but it is my favorite item for any age. I have used this with two to eight year old kids. I have the basic colors from the class pack; red, blue, white and yellow. The kids learn how to mix colors to make the ones they want. Model magic encourages creativity in the kids. Even with instructions of what to make, all the kids creations come out unique. Model magic is also really good for developing fine motor skills in younger children. The younger kids were better at mixing the colors then the older kids because they loved pressing it together. I much prefer model magic any day over other brands. Model magic is less flaky meaning none of it gets in my carpet and other areas of my house. Model magic can be used in almost any lesson. We used it make dinosaur and insect fossils, to make cars and boats and to make presents for our family. One kid even made a bomb out of it. After it is done being used it can be sealed up to use again or left out to harden. If it is getting a little dry water helps make it more pliable. It does leave a residue when it gets wet, but is easily washed away. For all these reasons Model Magic made it to number one on my list. Teachers also love model magic. Sonja Vaughan a first grade teacher says, "I like the modeling clay because its easy for kids to use, doesn't leave a big mess after and its easy to cut/divide. Sounds weird but when you having to split it up quickly having it already split into 4 parts makes a huge difference. We make clay earths (layers of the earth) every year and I cut them in in half show the difference layers." 2. Washable Crayons There was a box of washable crayons in the box. Washable crayons are a little more expensive than regular crayons, but so worth it. They wash away like magic. I have spent hours scrubbing regular crayons out of the wall, counters, surfaces everywhere and it is not fun I tell you. I have drawn with these crayons on a surface and they come out so much better. Their color is also brighter than regular crayons. It has to do with the chemistry of the crayons. 3. Powerlines Markers These markers came in number three because my kids love these markers. They are bold colors. The tip can be used to draw thin or thick lines, and they smell really good too. My daughter loves to draw with them and calls them my special markers. She would use them while my three year old was asleep, he is a little rough with markers, but is getting better. We got another set in the box Crayola sent us and my kids are excited to have their own. Even this morning, when my son first saw them, said, "These are my markers." I also learned that these markers are washable by accident. My kids drew on a surface and it came right out with water. Any marker that washes right out is gold in my book. 4. Metallic and Glitter Markers These markers are not washable and should be used with extreme caution. That being said, they are some of my favorites. Why? I love specialty Crayola sets. I love anything sparkly and fun. I use them when I want to add a pop to a photo like the one on the right. The kids also love them too because they have glitter. Make sure to watch the kids when they are using them. Pick these up at Target, they are insanely more expensive other places. 5. Ultra Clean Washable Markers These are my favorite markers by far for kids. I will buy them any day over the Classic non washable markers. I have made the mistake of letting my kids use my old non washable markers and regret it every time. My kids love markers, and they get on so many surfaces. 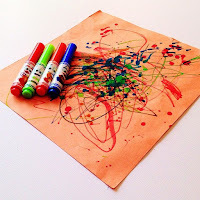 With a wet paper towel I can easily wash the mess away. Jennifer Garcia a former fourth and fifth grade teacher now stay at home mom says, "I can let them color away without worrying about ruining clothes." Pop the clothes in the wash and the stains are gone. My daughter loves the Tropical set of Ultra Clean Washable Markers and uses them every day. If your kids do draw on themselves, it does take soap to wash it out of their faces. Jessica Goodrow, a former 2nd grade teacher, now stay at home mom has an alternate way to wash them off skin. She says, "I love the "Ultra-Clean" Washable Markers...They really are ultra clean and pretty much can be wiped off of anything, including skin, with a baby wipe!!" 6. Pip-Squeaks If you have a child between 18 months and 4 the Pip Squeaks will likely be their favorite markers. They are my sons. He likes the faces on all the markers, and all of the specialty sets that have come out recently. He especially loves the Pip Scents and frequently opens the ones I am collecting. We keep them in a bag for him and he gets them out often. He is not very good about putting lids back on so it is nice for him to have his set so he does not dry out the other markers. Here is one of his creations. 7. Colored Pencils These were not in the box Crayola set me, but we love colored pencils. My daughter uses her 50 count Crayola colored pencils often. 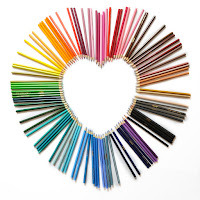 I feel like colored pencils often get overlooked, but we love them around here. I prefer them to crayons, because they are so much more versatile. Crayons are not as clean or smooth. 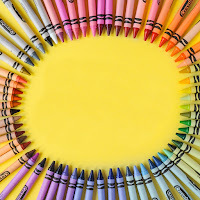 Colored pencils can be used filling in, shading or crosshatching. The pressure on the pencil also produces a different result. All these ways of coloring produces a different color and can really bring a picture to life. 8. Doodle Scents Markers and Super Tip Markers I love super tip markers for coloring pages, doodle scents have the fine tip. Fine tip markers are some of my favorite markers to use for every day items, such as lists also. There was a phase in college where I used fine tipped markers for everything. Doodle Scents is a marker sent that was elusive to me last year. Last year Crayola only sold the individual markers in the US and not the 18 count box. I bought two of all the individual markers and a box of them when they came out. I was so excited to find they were being sold in the US this year and for a reasonable price. Except when I found out that Canada has a 25 count box. Now I want to find that one. Then I will have four copies of some of the markers. More to color with. 9. Paint My kids love to paint. It is definitely an activity that needs to be more closely monitored than coloring with markers or Model Magic. Do not try to do anything else while your children are painting. Otherwise you will have a clean kitchen and a messy play area. Set up rules for the kids when using paint. IE not on themselves or the table and put something on the table. It will come off, but this prevents it from getting everywhere. I use an old sheet on the table they are painting on. That way after the kids finish I take the sheet off the table, throw it in the wash, wash the paintbrushes and kids hands and am done. My son would have this be number one on the list. He is always trying to get into the paint even when it is very high up. 10. 64 crayons How could I write a back to school Crayola list and not include the 64 classic crayon box? I would include the 96, 120 and 152 count boxes on this list too. I love having a variety of colors to color with and sort. I prefer the 64 count box over the 24 count box because of the variety of colors. These larger count boxes helped me discover the world of color when I was younger. Currently my daughter has two 64 count boxes she loves to color with. Monae Maruyama a speech pathologist teaching Pre K to 5 grade loves the glitter crayons, available in the larger boxes and their own separate box. 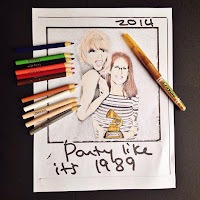 "Glitter Crayola crayons are like gold in my room! I ALWAYS have a large box of Crayola Crayons on the table so my students can color in between turns. They get so excited to see who can find the glitter crayons. They literally act like they found a hidden treasure." Last but not least, the TEACHER FAVORITE. I asked a group of teachers what their favorite Crayola product was and I was super surprised. Crayola Twistables had an overwhelming vote for number one. Here is what some of the teachers had to say. Stephanie DeLussey, a special education teacher says, "Not only are they a great fine motor lesson for students to actually use the crayons, but in a class of students with special needs who enjoy breaking crayons, it is easier to monitor crayon breaking because they have to twist the crayon out far enough to break it." Kristen Bowers, a Kindergarten through 5th grade Speech Language Pathologist says, "The Crayola twist-up crayons are the best! They last all year because the don't break and the kids really think they're something special. Plus they work for older kids where regular crayons would seem too childish." Kristine Lindsay, a preschool teacher says, "Not only are they perfect for my preschoolers but are equally beneficial for my 2 year old son! Most little ones I know have a "habit" of breaking crayons (many times on purpose! lol) so the twistable crayons take care of that. To stretch the benefits even moreee... It's fun to see how many of my students can follow the simple directions of 'twist' and 'stop'." I have not used Twistables that much. But after hearing so many good things the teachers said about them, I am going to get out our supply of twistables. Do you agree with my list? Which one is your favorite? Let me know in the comments. Now hurry out and buy all the fun school supplies while they are still on sale.